Pinemeadow PRE Men's 16-Piece golf club set is fantastic because it not only comes with all the clubs that you need but also a beautiful stand bag and a dozen golf balls. Everything in this set is top notch with the Driver being Titanium enhanced and with a graphite shaft. The Fairway wood also has a graphite shaft and a distinct design that gives it a low profile to ensure you get impressive shots from the fairway. Its stainless steel Irons are also very impressive, and the Hybrid is one of the most versatile that you can ever get. Pinemeadow PRE Men’s 16-Piece golf club set is fantastic because it not only comes with all the clubs that you need but also a beautiful stand bag and a dozen golf balls. Everything in this set is top notch with the Driver being Titanium enhanced and with a graphite shaft. The Fairway wood also has a graphite shaft and a distinct design that gives it a low profile to ensure you get impressive shots from the fairway. Its stainless steel Irons are also very impressive, and the Hybrid is one of the most versatile that you can ever get. If you add in the accurate Pre Mallet Putter, the stand bag and the fact that you get a dozen balls, then you have a best golf club set for beginner. 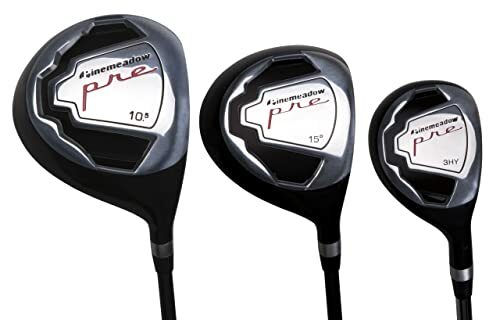 Driver: This set comes with a titanium enhanced 10.5-degree driver that has a unique design to ensure that you get maximum power and distance. It also has a graphite shaft for durability and a head cover. Fairway Wood: The Fairway Wood is 15 degrees, and it has a graphite shaft. Its head design gives it a low profile to help you get impressive shots from the fairway. And just like the driver it also comes with a head cover to protect it. Hybrid: Hybrid club provides you with versatile options to get the ball from any lie, and this will improve your play significantly. It has a premium steel shaft for maximum power and durability and a head cover for protection. Irons: It is a complete set, and so it has 4, 5, 6, 7, 8, 9 and PW stainless steel Irons that have perimeter weighted Irons, a wide cavity back and decent sweet spot that is easy to locate. They all have tour style grips and stainless steel shafts. The Putter: This set comes with a Pre Mallet Putter that is weighted for improved feel and to give you a better response. The distinctive design of the putter will allow you to align the ball correctly and also give you the confidence to make those vital putts. Stand Bag: The stand bag has an integrated kick stand and a matching rain hood to protect your clubs from rain. It also has dual straps in a backpack style that make it easy to carry around the green. This bag is also very lightweight to make it comfortable to carry for several rounds of golf. Extras: You will also get a dozen golf balls when you but this set meaning that it comes with everything that you need to play the sport. These are among the most forgiving clubs for a golfer, especially for beginners. All the clubs have a very solid feel when hitting the ball, and this will increase your confidence with every swing. 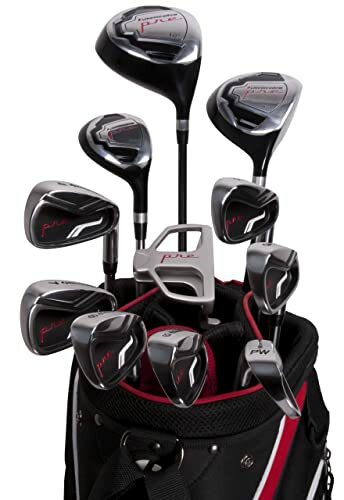 Although it is a low priced set, the quality, and performance of the clubs is top notch. The stand bag is easy to carry around the course, and this is because of its dual straps that have a backpack style. This stand bag also has lots of exterior pockets for all the essential things that you need when on the course and also a towel hook. It has a shipping weight of 30 pounds, and this makes it one of the lightest complete sets on the market. Graphite shaft in the hybrid will give you an impressive balance between control and balance. The putter works well, but it would be better with some improvements to make it feel balanced. They are not suitable for someone with a single handicap. Some golfers also complain that the sweet spot is smaller than what you find on other advanced and more expensive sets. Some of the heads will break off after a few weeks of regular play. The strap buckles will snap after a short while because they are plastic. The 21 degree 3-Hybrid will feel a little awkward before you get used to it. Although any golfer can use this 16-Piece set from Pinemeadow, it is best suited for a newbie. It has all the clubs that you need to enjoy the beautiful game of golf, and the best thing about it is that everything is very high quality. Although it is a low priced set, the clubs are very forgiving, and you can be sure that they will give you excellent performance. In fact, you will not find anything better than it at that price. And so whether you want to play golf just for leisure, or you hope to become a professional playing in a tour someday then this 16-piece is perfect to get you started. It might have a few demerits, but there is nothing major that you cannot overcome.